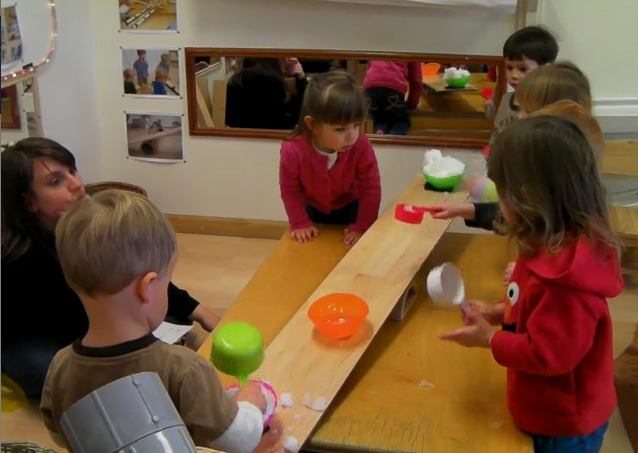 The teacher in this video deliberately holds the children to one question, how can we make the up side of the plank (on a fulcrum) go down without pushing on the up side? While the use of passive weight to make a plank move, as opposed to pushing on it with your hands, may be slightly above these children's experience, we still need to figure out how a teacher can introduce such ideas. Or, maybe the content of the questions is less important than the form of the questions and answers. The children do know that a sentence beginning in "why" calls for an answer beginning with "because." This in itself gives merit to the learning encounter. There is also the teacher's attempt to have the children reflect on the structure of evidence. If both dishes of snow are “slippery” and both dishes are “smart”, how can you use either to explain that one is up and the other is down? In other words, similarities cannot explain differences. While it may be too advanced, children do learn that the logic of evidence is relevant, even if the reasons are not yet clear. Like learning a new language, we sometimes capture the form and rhythm of sentences in that language and gradually add the meaning. We would not call these early stages of learning rote. We prefer to call them pattern identification that then makes it possible to add meaning more efficiently and discriminatively. Different patterns have different meanings, the specifics of which come gradually. By listening carefully to the teacher's questions, the children's answers, and by watching what the children do with their hands, you may well conclude that this highly teacher-directed activity had its benefits. The teacher continued to set rules on what could not be done. Her goal was for the children to invent taking snow from the pink to add to the green, instead of just adding to the green from the bucket of snow. Without constraints, how can a teacher engage the mind of the children? The children could simply push on the plank with their hands without inventing anything new. You may notice instances when a phrase like "fall down" or a "without touching the bowls" may have misled the children. The bowls did not really fall down. To her credit, the teacher later changed to the phrase, "go down." Possibly, the children initially thought they could not do anything to the bowls, including adding snow. The teacher might have said, "don't move the bowls." Encouragingly, toward the end of the video the children were adding snow to the green, and even taking snow from the pink. Alas, the weight change did not cause the green side to go down. What other materials may have better accentuated the effect of the children’s actions? Look at the following transcript and think about the children's thinking, such as why "smart" and "slippery" were offered as reasons, and what is the difference between describing what happens and explaining why it happened? What may children learn from a teacher-directed investigation that they may not encounter when experimenting and identifying questions and answers themselves. Take your time. T1: The pink fell down but the green didn't. Why? Why did the pink fall down? C: Because it's really smart. T1: That one idea, cause it is really smart. What's a different idea about why it fell down? C: Because it's really slippery. T2: Snow is definitely slippery. Asher, I have asked you not to add more snow until we figure this out. C: Because it is not going but the green one is. T1: What do you mean by that? T2: Ainsley, why do you think the pink one fell down? C: Because it's made out of snow. T2: It is made out of snow. Is this one also made out of snow though, the green one? T1: Then why is this one up (points to green dish)? C: Because it’s really smart and it goes up. T1: But if the both are really smart it does not explain why that one went up. T1: So, they both, you’ve said, are really smart, they both are made of snow is what Ainsley said. T1: Without touching the bowls or the plank, how can we make the green go down? T1: Yeah, it is slippery on your feet. T1: Asher, can you use your scoop, and try to make the green go down? T1: Without touching the plank. (Girl tries to get snow from pink dish but plank moves away from her as she leans into it). T1: Watch your body. Be conscious where your body is. T1: Yep, the snow is empty and we have to use the snow we have. How can we use the snow we have to make the green go down? (Asher presses on the green side again). T1: We said touching it was one way but we weren't going to touch it, we were going to try to use the snow. T1: You added a bowl. What do you think adding another bowl will do? Why did you add another bowl? Why? C: Because I get some snow out of the drain, out of the chimney. T1: You're going to get some of the snow out of the drain? T1: Oh, the green. Okay get some snow out of the green and see what happens. Ava has to wash her hands before touching the snow.